Millions of pounds are spent every year on interventions that aim to help people in the UK better manage their money. Even so, relatively little was known about ‘what works’ to improve financial capability – until now. Roxana Prisacaru from The Money Advice Service What Works team shares their experience of building a body of evidence. 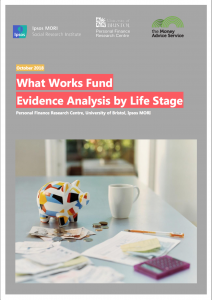 In April 2016, the Money Advice Service (MAS) created the What Works Fund (WWF) to fill major gaps in the UK evidence base for financial capability. The fund is underpinned by our firm belief that good decision making must be grounded in good quality evidence. Where evidence is not available, we should use high quality methods to find out what works and – just as crucially – what doesn’t. This is the first time that comparable data has been produced at this scale in the UK. The fund is underpinned by our firm belief that good decision making must be grounded in good quality evidence. Following a rigorous proposal development and selection process, we awarded funding to 65 projects across the UK. Our grantees targeted all demographics using a wide range of delivery approaches from intense one-to-one support to peer led group sessions and mobile app-based support. Two out of three used the funding to pilot and learn from new approaches, while others evaluated existing work, including scaling up current activity. An important goal that we wanted to achieve through WWF was to produce new evidence in a robust and consistent way, using a common set of comparable outcomes. As such, grantees were expected to use The Strategy’s Evaluation Toolkit and its financial capability outcomes frameworks as a condition of grant funding. Where evidence is not available, we should use high quality methods to find out what works and – just as crucially – what doesn’t. To help our grantees carry out high-quality evaluation, we also engaged an evaluation and learning partner (ELP) formed of three research and evaluation specialists: Ipsos MORI Public Affairs; the University of Bristol’s Personal Finance Research Centre; and Ecorys. The ELP supported and quality assured the work of our grantees from the initial design stage of their evaluation, through to implementation and reporting. We’ve funded 65 projects, invested over £11 million, helped over 40,000 people, and tripled the amount of UK-based evidence available. After more than two years of intensive work, we are extremely proud to see the results of our work coming in. To date, 55 grantees have concluded their evaluations, and the remaining ones are due to submit their reports between now and spring 2019. Across the WWF portfolio, we’ve funded 65 projects, invested over £11 million, helped over 40,000 people, and tripled the amount of UK-based evidence available on how to improve people’s financial capability. For the first time, we’ve gathered substantial, robust evidence on what works, what doesn’t, why, for whom and in what circumstances, filling gaps in knowledge by answering some key strategic questions. Our WWF evaluations include some large scale studies and randomised control trials that have tested ‘what works’ in a consistent and comparable way. This is the first time that comparable data has been produced at this scale in the UK. Of course, we want all this evidence to be available to you, so that together we can help more people make the most of their money. With this in mind, we’ve made WWF evaluation reports on each project available on our free-to-use financial capability Evidence Hub, so you can easily put these learnings into action. Click on the reports to download them. In addition to the individual evaluation reports, our ELP have produced a thorough analysis of all WWF evidence gathered to date, to understand what the evaluations tell us about ‘what works’ to improve people’s financial capability. 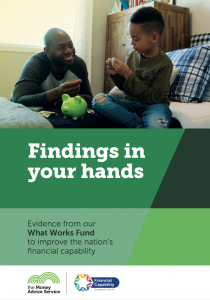 If you want to know more about what works to improve financial capability for children and young people, or what are the design and implementation tips and challenges for financial capability interventions targeted at working age adults, please do take look at our analysis. The evidence collected will inform ongoing activity as part of the UK Financial Capability Strategy as well as at the new Single Financial Guidance Body. 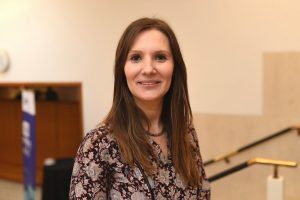 The Evidence Analysis is part of a suite of outputs that will be produced by our ELP to make the WWF evidence useful, accessible and relevant to a wide range of audiences, from researchers and evaluators, to policy makers, practitioners and commissioners of financial capability interventions. Thanks to WWF, we now have better insights into what works and what doesn’t, so every penny invested can help people more. Future financial capability interventions will be far more effective and far more efficient as a consequence. The evidence collected will inform ongoing activity as part of the UK Financial Capability Strategy as well as at the new Single Financial Guidance Body (SFGB), which brings together The Money Advice Service, The Pensions Advisory Service and Pension Wise.